A friend sent an article that posed a challenge … to read something you don’t normally read. Now, I SUPPOSE that meant I should read a book about the history of the relationship between North Korea and South Korea, or maybe a tome on the rise of the drug cartels in South America. But no! The first thing that popped into my mind was to read a genre I had assiduously avoided ... a horror novel by Stephen King. 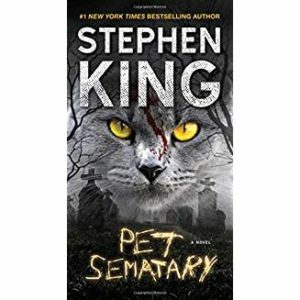 And so I picked the one King himself describes as “the most frightening book I’ve ever written.” I was curious to see why this author is so popular. Well, okay, I am now done with horror again. Not because it was so scary, but because it was boring! King writes to a general audience, and so he does not provide a lot of depth or subtlety or complexity. I like his use of short quick sentences, however. I found them engaging and fast-moving. This story line in this book is what you might imagine – bury your pet it this place and it will come back to life, though typically meaner and scarier and more evil than it was before it died. Of course, the characters in this book begin to see applicability for humans as well. About half-way through I really wanted to put the book down, but I decided to complete my commitment to myself. What I learned about this style of writing is that while there are hints of horror to come, really there is a lot of plot and storyline that needs to happen before the horror can have any emotional impact. The horror in this book all happened in the last 50 or so pages (it’s a 400-page book). So, don’t waste your time. And, in the future, I promise to consider carefully what challenges I accept. So I wonder, why is he so popular? Are his loyal readers those who line up for the horror movies or do they prefer their horror only in print? You can be absolutely certain I will NOT read this book or any other by Stephen King. I would rather have read the one about North vs South Korea. Yuck! But good for you for sticking to a challenge. You are a better woman than I am. Thanks for your review! If I was ever tempted, I now know that there is no reason for me to pick this book up, nor others he has written. Good for you for finishing the task. That is impressive. King is popular, IMO, because of his writing style. It’s fast, breezy, with the just the right amount of mystery, suspense, blood, and weirdness. Andrea, I give you an “A” for effort! King has written some books that don’t fit the horror genre. “Hearts In Atlantis” “The Girl Who Loved Tom Gordon” are two I’ve read and enjoyed. I should post more one-hear reviews! This generated more comments than most any other review in my blog! I believe the one about the Kennedys was titled 112262 or something like that (date of the assassination). It was a selection for my book club. I tried it. Didn’t get too far. Missed the session it was discussed at. Members who finished it liked it. It’s another really long book.